The latest edition of The Paralegal Voice, “The Importance of Technology in the Paralegal World" co-hosted by Lynne DeVenny and me, is now available at Legal Talk Network. 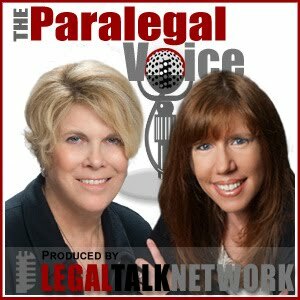 In this episode, we welcome Kim Plonsky, a frequent contributor to Paralegal Today, who works as a paralegal at Gainsburgh, Benjamin, David, Meunier & Warshauer, L.L.C., in New Orleans, Louisiana. The Paralegal Voice also thanks its sponsors: Westlaw Deposition Services and NALA...The Association for Paralegals and Legal Assistants. Certification: Is it the path for you?